Trap is a dance music sub genre that has become a personal favourite of Tiësto who’s been dropping the heavy bass in his sets throughout 2013. 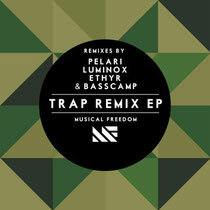 Now, he cements his support for trap with the July 30 release of ‘Trap Remix EP’ - Musical Freedom Records’ first trap music release. Rather than just release a bunch of trap tracks, Tiësto collected some of the best trap remixes he’s heard of various Musical Freedom releases. The resulting ‘Trap Remix EP’ is a four-track package that includes Dimitri Vegas, Like Mike & GTA ft Wolfpack – ‘Turn It Up (Pelari Trap Remix)’, Sandro Silva & Quintino – ‘Epic (Luminox Remix)’, R3hab & ZROQ – ‘Skydrop (Ethyr Remix)’ and Tiësto & DJ Punish – ‘Shocker (Basscamp Remix)’. Starting things off, ‘Turn It Up’ gets the full-on trap re-rub from Swedish newcomers Pelari who drop it deep with a sharp slice and dice. With ‘Epic’, Chicago’s Luminox opts to keep the signature synth line while reworking the bass and percussion for the low end of club. ‘Shocker’ is completely owned Washington, DC-based Basscamp who completely restructures the song while adding in heavy drums and sound EFX. Rounding out the EP, New Jersey’s Ethyr transforms ‘Skydrop’ into something you could easily see accompanying an action scene in a Hollywood blockbuster.